Prince of Persia: The Sands of Time (2010) is a fantasy-adventure movie based on the popular video game - Prince of Persia. 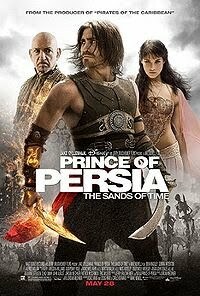 I like this short and sweet synopsis from Disney: Set in the mystical lands of Persia, a rogue prince and a mysterious princess race against dark forces to safeguard an ancient dagger capable of releasing the Sands of Time -- a gift from the gods that can reverse time and allow its possessor to rule the world. Jake Gyllenhaal is the rogue Prince Dastan of Persia and Gemma Arterton is the mysterious Princess Tamina of Alamut, the sacred city. She's also the guardian of the Dagger of Time. Ben Kingsley is Nizam, the villainous uncle who wants to turn back time so that he could be king instead of King Sharaman.